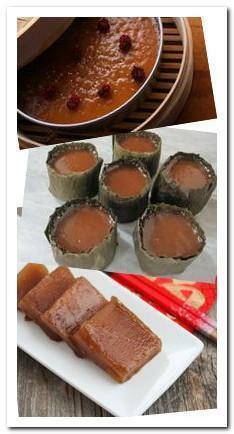 Nian Gao or Chinese New Year cake or Chinese sticky rice cake is a dessert prepared from glutinous rice. It is a very popular dessert during Chinese New Year. It is in beautiful golden brown color. It is very sweet, chewy and soft. It will be harden up after keeping for a few days. It can serve directly or pan-fry with egg batter, sweet potato and yam. There are a lot of creative and delicious ways to serve it. Bring water to a boil. Add brown sugar, stir until sugar completely dissolved. Set aside and let cool to room temperature. In a large bowl, pour in glutinous rice flour, slowly add in cooled brown sugar syrup and milk. Mix and stir until the batter smooth. Fill cake pan with batter. Steam for 1 hour or until the batter is firm to touch. Check steamer occasionally, if the water level is low, top up with hot water. Leave it for at least one day, it is easier for cutting.